The Nefesh B’Nefesh flight just took off, filled with 32 families, 95 children, 53 singles and 12 IDF Lone Soldiers. 11 years ago at this exact moment – that was us. Our lift long gone and on the way to Greece (where it would remain for a one month strike), we carried with us all of our hopes and dreams, our futures on our backs. We carried with us our file, filled to the brim with our birth certificates, our diplomas, the doctors’ files for our two kids, and the file for my pregnancy. 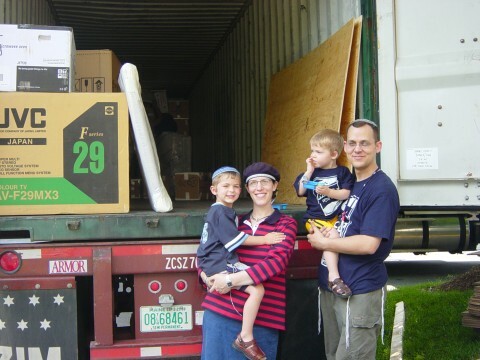 We did not carry along any jobs, any pre-purchased home, any cars or any Hebrew skills. All of that, or at least most of it, would come with time. What we did carry, however, was a dream. A dream to connect to the history of our people and to return home. To return HOME! 11 years ago at this exact moment we were a couple, two kids and an extra heart beat flying on a dream. I will admit, there were times when I thought we were absolutely insane. As American Jews with great jobs, a nice community, family in the country and thriving children, we were not running from anything. And where we were going was quite unknown. Some people talk about the trials and tribulations of Aliyah. I actually found the process and the adventures that awaited us incredibly fun and exciting. What few discuss, however, is the difficulties in the weeks leading up to the move. Once we arrived on the ground, put our feet on the soil and started to connect to our surroundings, my fears and worries evaporated. We were here. We had things to do and offices to go to. 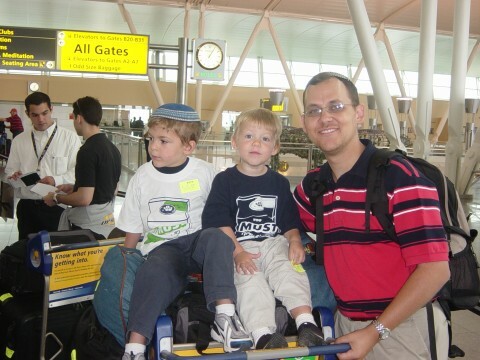 But in the weeks before we left, as we wrapped up our lives, said goodbye to our colleagues, hugged our families, sold our home and drove off of our cul-de-sac to our future (with our friends waving an Israeli flag in the background), I was a mess. The unanswerable questions were massive. The unknown future was looming. The question marks were everywhere. The 53rd Nefesh B’Nefesh charter flight will touch down tomorrow morning a bit before 7am, ushering in new lives to those 32 families, 95 children, 53 singles and 12 IDF Lone Soldiers. Turns out, of course, that he was the President of El Al. And I was not, yet, a true Israeli who trusts in the people who come barreling up to help us out. Today, I would have gladly given him my bags, my baby, my burden to carry. Because it there is one thing I’ve learned after 11 years of sweat and tears and unimaginable joy it’s that we are all sharing this burden together – that we are all carrying each other’s bags in the wondrous, frustrating, stupendous and glorious miracle that is the State of Israel.